Some background before this post: Coulee Con is coming up, and I recklessly took the plunge and submitted two games to GM at the end of August. The first submission is Beowulf using the Yggdrasill system. The second is a Conan game called “Blood in Their Wakes” using the brand new 2d20 Modiphius system for Robert E. Howard’s Conan: Adventures in an Age Undreamed Of. I call these submissions “reckless” because the last time I submitted a game, “The Boon of Barrow-Isle” for the Yggdrasill system at Gamehole Con 2016, I belatedly realized that I was nowhere near prepared enough to run it. Therefore it was a mixture of disappointment and relief when absolutely no one signed up to play. Now, for Coulee Con, I feel prepared enough to run an Yggdrasill game, having run a campaign of it off and on now for almost a year. But Conan puts me in a situation similar to where I was last year with Yggdrasill. I am enamoured with the material and the system and really want to be an ambassador for it. Therefore I committed myself to it by submitting a game, and with my home group I’m fairly anxious to familiarize myself with the crunchy 2d20 system. So I have to get to the “Beowulf” content in my Yggdrasill campaign to provide myself with plenty of time for the Conan rules set. And this haste and anxiety led to the thoughts that I have for this post. Last session I made good on my resolution to resort more to the runes as a game mechanic, but I did something else that, during post-game analysis, I regretted. If I could go back to our last session I would act differently in response to a player’s question. This falls under the topic of “Just say yes” during improv play. GM: So the oaf has you down with your back on the table. His massive mitts are around your throat, slowly squeezing the life out of you. What do you do? Player: I look around. Is there something nearby that I can grab and hit him with? GM: Yes, in your periphery there appears to be a kettle. Made out of iron, maybe, and you sense heat emanating from it. Perhaps it is full of hot water? I have presented the “Yes and” principle here at the microcosmic level, and this would be perfectly acceptable in one-shot convention play. Giving the player something to hit her antagonist with, and adding to the request the detail that it is full of hot — maybe even boiling — water isn’t going to drastically derail the track the GM has prepared for a satisfying arc that hopefully fits neatly into four hours of play (unless it’s going to, but that’s up to the judgment of the GM). But the “Yes and” moment I encountered last session had greater implications. Instead of saying yes, I said no, and I know why I did at the time. After thinking about it, though, I wish I had said yes, and the answer is because of this: I said no because I was impatient to get to the microcosmic “one-shot” aspect of my campaign. But I should have recognized that I wasn’t playing a one-shot but a campaign. As such, I should have said yes. I’m doing something potentially problematic with my regular group. I designed a Beowulf campaign for convention play, and I want to playtest it with my group in the midst of an ongoing campaign. As a result, some edges of Beowulf need to be rounded and trimmed and sharpened. There are many campaigns, I know, that operate this way. That’s why people buy published adventures, after all! But not everything is a full adventure path. The GM has to determine how to incorporate his “second-party” material into his wider campaign arc — and the campaign arc, I’m convinced, should be a collaborative experience between the GM and her players. This is why in general I have such difficulty with published adventure materials. Often I have to modify them to the point where it would be much more efficient for me to just build my own content from the ground up. Also, when running a game like Yggdrasill (in contradistinction to OSR games), my “sandbox” style of play is less a hexmap of “hidden encounters” that the PCs uncover or reveal as they explore… Okay, to follow the “sandbox” analogy further, it’s less of a series of sand castles that somehow are hidden from the players, but more of a wide expanse of unshaped sand that the players and I together will form into a story. I am to be forgiven, and I know my players will forgive me, for being impatient to get to the actual “Beowulf” component of our Yggdrasill campaign so that I can test it and move on to the Conan game “Blood in Their Wakes”, but what I want to remind myself here is that my players are not first and foremost my playtesters but instead first and foremost my regular group of campaign players. This has been preamble enough to what exactly went down. A few posts ago I introduced Yggdrasill to Matt Finch’s Tome of Adventure Design. I generated a table of possible adventure hooks for if the PCs decided to go snooping about the shoreline during their trip to Hleidra. For whatever reason, I entirely ignored that table last session. Instead, I drew runes and improvised on the spot, which also is entirely acceptable. But drawing the runes perhaps would have been more effective if I had coupled them with my table. Nonetheless, I had plenty going on: despite the warnings of the PC Lydia, who is a Volva, the Sjaellings had looted the Barrow-Isle of cursed gold. As such, they were becoming paranoid Smeagol-ish people, thinking everyone else was after their shares of the loot. This quickly became a problem when the Sjaellings began to mingle in the fishing village of Klepp which was crowded with three longships of trading Geats! 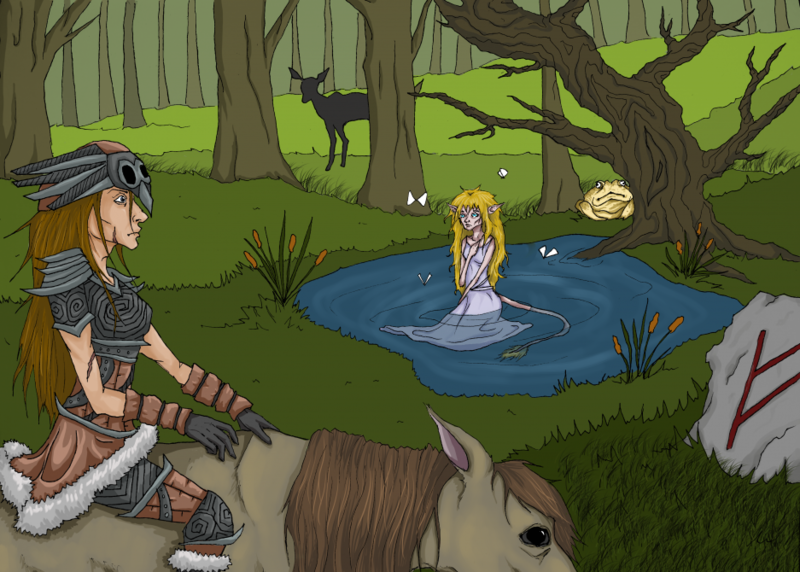 After some antics ensued, Lydia asked me if there were any Volva nearby. I consulted a rune and determined no, there were not, being unable to connect the rune directly to Lydia’s request. Beneath a field of clover is a massive bee hive, tended by Volva who brew from it mead that augments skills of prophecy and poetry. The local jarl wants to export it, and there is increasing tension between the jarl and the Volva. It is said that a Volva harvests the webs from a thousand spiders that visit her garden each night. From them she spins garments of supple but strong fiber. Really, the rune I consulted should have determined which of these Volva were nearby, not whether there were Volva at all. During gameplay I was happy to skip this information and a possible time-eating excursion, thereby forestalling yet again the playtest. But the detour would have been richer overall for the campaign. And it would have rewarded a player for excellent gameplay. And it also potentially could have better prepared the Volva for what is going to be no easy encounter with Grendel! So really my point here is that there are two types of games: campaigns and one-shots. There are two types of players: campaigners and dabblers. There therefore are two types of ways to say “Yes and”: yes, there is this possibility of an adventure that we will build right now out of the amorphous sand and yes, there is that particular item for sale right now in this fletcher’s hut. In campaign play, a GM’s first responsibility is for his campaigners, and she never should lose sight of that larger narrative structure in deference for the smaller. The campaign is an epic, the one-shot is a tightly-driven short story.